Greetings to anyone who happens to find this little blog post. This here is a small review, plus a critique to the ideas on chapter 26 of the book Breaking the Free Will Illusion for the Betterment of Humankind, by 'Trick Slattery. This was originally going to be an Amazon review, and thus, this piece addresses the author of the book directly. Which I strongly recommend you do! Just skip chapter 26, pay no attention to any mention of "deservedness", and you're good to go. You can get the book on Amazon.com, through the link below. Note: The following is an Amazon affiliate link. If you purchase anything on Amazon after following said link, I earn a commission. Introduction: Praise for the book! Hello 'Trick. This is Santiago, a reader from Colombia. First of all, I thank you in advance for taking the time to read this… if you are. This blog post is a bit long, so if you don't have time to read it all, you can find a TL;DR at the end of the post, right here. Thus, I decided to just post my review here on my personal blog, to share it with you and any others who might find it. With the exception of chapter 26, and whenever you mention "deservedness" here and there, I think your book is brilliant. 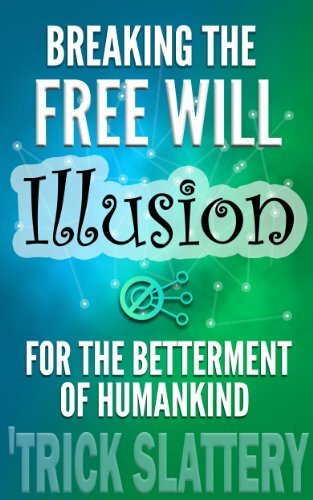 It's packed with great arguments and concise explanations that show why free will is just a perceived illusion in the brain, and not something that humans have in reality. You certainly opened my eyes! For instance, I finally stopped blaming myself for my past mistakes. Remembering my mistakes is something that has been tormenting me mentally for years and years, but now that I understand I couldn't have done otherwise than what I did, I finally feel not only full acceptance, but also peace in that regard. I also stopped feeling hate towards people, and I don't think I'll ever feel like that again. I used to hate some people due to the terrible things they did to me, and/or to other innocent people. But now I realize it makes no rational sense to hate them, because they couldn't have done otherwise. I'm still practical in the sense that I avoid people who have wronged me, because I know that due to their nature, they are bound to wrong me again. I also don't love them... but I don't hate them either. Hate is like drinking poison and expecting the other person to die, so I'm very glad I no longer feel what my brain now perceives as something totally illogical. Overall, I must say that your book has been a VERY positive influence in my life, and I'm very glad I purchased it and read it all. And I look forward to reading the rest of your website! The entirety of chapter 26, and your idea of "deservedness" being irrational, is flat out communist propaganda. But I can't post a review on Amazon because I don't have $50 to spend on the website. However... I do NOT think it's unfair in any way that other people do have $50 to spend on Amazon, and I don't. Sure, that is unequal. It's an inequality... but that inequality is NOT unfair. If I don't have those $50, it's simply because I haven't provided enough value to other people to have earned those $50. In other words, at this very instant of writing this piece, I don't deserve those $50, and thus, there's no reason for me to have that money, or feel entitled to it. "Deservedness is a concept that makes no rational sense due to us having no free will – it's as irrational as blame and hate." "A person should only be held more deserving of something over another person if they could have, of their own accord, chosen otherwise, and if the other person could have, of their own accord, chosen otherwise." Deserved: Adj. Rightfully earned because of something done or qualities shown; merited. ‘A deserved standing ovation’. ‘A deserved victory’. Rightfully: Adv. In accordance with a legitimate right or claim to property, position, or status. Ok, now, according to this definition of "deserved" (which I personally agree with), you "deserve" something when you earn that something rightfully (a.k.a fairly), as a result of actions you did. It's true that you didn't do any single one of all those actions out of your own free will, because such a thing doesn't actually exist. It was still YOU who DID all those actions that led you to earn that something. You see, to "deserve" something has to do with the actions you take, and the results of those actions. Whether you take those actions out of free will, or out of causality which is entirely out of your control, is irrelevant. You didn't write the book out of free will – you wrote it because that was what had to happen due to previous causes like your current knowledge and beliefs, life experiences, desires in your brain you can't control, etc. However, it was still YOU the one who caused the book to come to life. It was the information within your brain, in conjunction with the actions of your body (sitting in front of the computer, typing words, etc. ), that resulted in the creation of the book. The actions of your brain plus body resulted in the creation of your book. You didn't create it out of free will, but it was still YOU the one who put in the effort to create it. It was you who ended up causing the book, whether you had free will or not to cause it. And then, after your brain plus body finished creating the book, you posted it on Amazon and started selling it. And you started earning some money out of it. So, if you created that book out of causality (not free will), do you deserve the money you are receiving for selling the book, or not? As I see it, according to the definitions I've presented for "deserved" and "rightfully", you DO deserve the money you've received. 1. You and your actions still caused the book to exist – whether there was free will or not involved doesn't matter. 2. You accept as fair the idea that humans have a right to have personal property, and you see your creation as a piece of intellectual property that you can sell. 3. Other people who found your book valuable (causally) decided to give you money in exchange for it (like me!). 4. You accept as fair the idea that humans have a right to have personal property of the money they've earned – that is, that they have the freedom to save it or spend it however they wish (minus some reasonable taxes). Basically, for those reasons (there might be more that I'm missing), you DO deserve the money you've received so far for selling the book. "Hello Mr. Slattery. It came to our attention that you are selling a book on our platform, and have profited from it. However, you didn't create that book out of your own free will – it's something that you did causally, without real control from your part. Thus, you don't actually deserve the money you've earned so far from selling the book. So, to make Amazon a more equal place, we are going to take 95% of the income you've earned from your book, as well as any future income you may receive from your book, and redistribute it to all authors who are earning less than you within the platform. You have no right to appeal to this decision, as it's not like you created the book you're selling out of your own free will, or anything like that. Remember this is done to help eliminate inequality on Amazon.com – to make all authors as equal as possible within the platform. And afterwards, tell me if this situation actually sounds fair to you, or not. If you ask me, this situation would be unfair to the point of absurdity. 1. You created it (whether it was because of free will or causally is irrelevant). 2. And people (causally) decided to pay for said book as part of a fair exchange with you. Other people don't deserve that money you earned, because they didn't causally create the book – they didn't put in any effort to create the book, either out of free will or causality. Thus, it would be horribly unfair (to me, and I would say that to most rational people too) for any entity with the power to do so (in this case, Amazon) to FORCE you to distribute the money you deserve to keep, to people who don't deserve to have it. If you want to be an altruist, and donate a significant portion (or all!) of your book sales to any charity (like a "charity for less fortunate authors on Amazon", or something like that in this scenario), then that's awesome! That's an act you causally decided to do, without being forced directly by other humans. I can't see in what universe would that be fair, in any way. On one hand, the other authors who are earning less than you aren't to blame for their situation, because they have no free will. But you are NOT FREE from the consequences of your actions. So, let's say an author who is earning much less than you is earning so little because they aren't doing enough to market the book. Or maybe they wrote a book about a topic very few people care about (like chess variants). Or it's a combination of the two, or many other possibilities. It's true that the author is not to blame for being in that situation, due to free will not existing. However, that author is not free from the consequences that come from not doing enough marketing, or writing about a very obscure topic that very few people care about, etc. And in this case, the consequences of their actions (or lack of action) are that the book they wrote doesn't sell well. That's an objective consequence to their actions – it's just how reality is for that author in those moments due to their actions (and some other external factors too – a bit of bad luck, etc.). And thus, they get what they deserve according to that reality: Low sales. Given the causal actions of that author, low sales are a fair outcome. The author isn't to blame for his or her actions, but the author isn't free from the consequences of his or her actions. If, let's say, that author causally decides to search for help on the Internet, that could lead to a chain of events that results in the author publishing a new book, correcting their past mistakes, and possibly making more sales. 1. They didn't actually earn that money due to their own actions. 2. The money they are receiving was forcibly taken (a.k.a stolen) from people who actually worked hard to deserve that money. If I understood the chapter correctly, in chapter 26 you establish that because nobody has free will, it's not their fault if they are rich or poor, and the rich don't actually deserve their wealth because they didn't obtain it due to free will. Therefore, the "fair" thing to do in our society is to redistribute the wealth of the world so that everybody is "as equal as we can make them". "Should we apply force to help equal things out to the extent in which we pragmatically can? Some would suggest that we shouldn't. To those people, I'd suggest we have to use intervention and regulation in an attempt to equalize. And if people go against such flow, yes, force may be required." Which results in everyone being equally poor, AND HUNGRY, and miserable, except for the fat leader of the regime and his henchmen. I really, really encourage you to examine critically the evidence that shows us that communism is a system that produces extreme poverty, hunger and misery in society – exactly the opposite of what this system supposedly fixes. The evidence is in the countries that have already forced a communist regime, like Cuba, Venezuela and North Korea. If you honestly believe communism is fair… do you, for instance, sincerely see yourself moving to one of those countries, and living there? Do you think you could live a happy and prosperous life in Venezuela right now? Do you think the people who live there lead happy and prosperous lives? Unless it was causally determined to happen. Ouch! But once again, I really encourage you to examine the evidence more rigorously and critically. That is all 'Trick. I thank you once again for taking the time to read this (if you did). I wish you best, thank you for enlightening me about the nonexistence of free will, and I honestly hope you eventually drift away from the communist mindset. And always remember: Communism always works great… until you run out of other people's money. The book was excellent. I no longer see evidence for the existence of free will, and I no longer feel blame, nor hatred towards people. Thanks for writing it! Chapter 26 is wrong because "deservedness" has to do with earning something due to your actions, period. Whether those actions came about due to free will or causality is irrelevant. Also, the chapter promotes a communist ideology, which is unfair, tyrannical, and empirically shows it produces extreme poverty and hunger, as explained here. I encourage you to evaluate the evidence we have that shows communism doesn't work (Venezuela, North Korea, etc. ), and hopefully that will eventually make you change your mind.